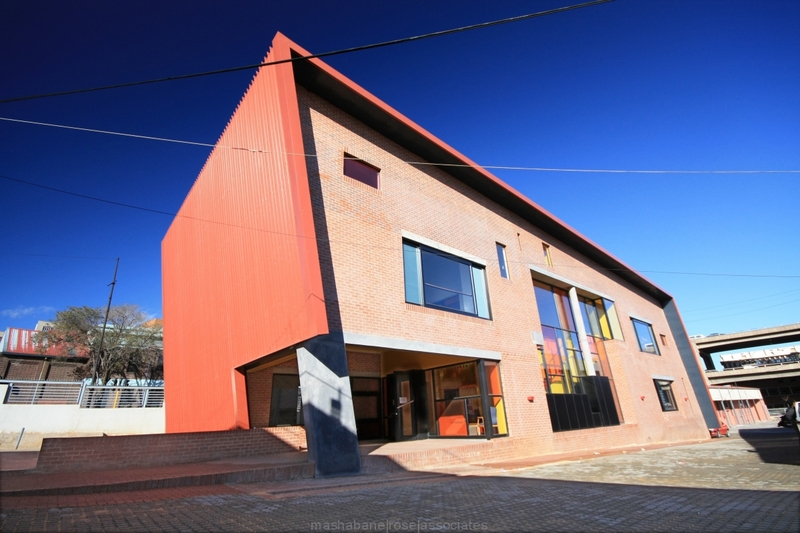 SITUATED IN THE HISTORIC BUT VIBRANT AND CULTURALLY-DEVELOPING NEWTOWN PRECINCT THE DANCE SCHOOL REFERS BOTH TO ITS HISTORICAL CONTEXT AS WELL AS EXPRESSING ITS CONTEMPORARY FUNCTION AS A DYNAMIC CENTRE FOR MODERN SOUTH AFRICAN DANCE. THE MATERIALS AND COLOUR PALETTE OF THE BUILDING TAKE REFERENCE FROM THEIR IMMEDIATE CONTEXT: THE PREDOMINANT RED FACEBRICK AND RED OXIDE COLOURED CORRUGATED METAL ROOF SHEETING OF THE SURROUNDING INDUSTRIAL HALLS. THE FORM OF THE BUILDING TOO TAKES REFERENCE FROM THE SIMPLE FORMS OF SURROUNDING STRUCTURES IN THE SHAPE OF A SIMPLE RECTANGLE, IN BOTH PLAN AND ELEVATION. HOWEVER, SETTING IT APART FROM THE HISTORIC SURROUNDINGS AS A CONTEMPORARY PIECE OF ARCHITECTURE, THE MOVEMENT OF DANCE IS EXPRESSED IN A SUBTLE, YET DELIBERATE STATEMENT, WITH A TILTING OF THE PLANES OF THE ROOF AND END WALLS. THE LARGE WINDOWS IN THE FOYER AND IN THE DANCE STUDIOS ALLOW VISITORS TO THE SURROUNDING AREA TO SEE THE ACTIVITIES WITHIN. THE BUILDING THEREFORE, TOGETHER WITH A SUNNY PUBLIC COURTYARD ON THE NORTH OF THE BUILDING, OFFERS ITS ACTIVITIES TO BE SHARED WITH THE PUBLIC REALM OUTSIDE. THIS SERVES IN BOTH PROMOTING PERFORMANCE ART WHILE AT THE SAME TIME CONTRIBUTING POSITIVELY TO THE SPATIAL EXPERIENCE OF THE NEWTOWN PRECINCT AT LARGE.